Make a stand to protect and conserve the elements, space and heritage which gives us life and connection. In light of the news reported in The Straits Times on 22 April 2017. It is being known that, the Rifle Range Forest will be closed from October 2018 for renovation till 2020. We hence present 5 areas of motivation, together some solutions/actions we can take together as a community. The ecology of the Rifle Range Forest is rich and diverse. It has an array of rare and even endangered species of plants and animals which deserve to be protected. We found fire flies lighting up the trees, in the evening between 7.30pm to 8.15pm daily. They are less active in dry weather. These fire flies only stay in unpolluted places, where bio-luminous materials and elements are available for them. We also found glow-in-the-dark mushrooms and other glowing bugs. All these show that we have a clean and unpolluted environment in the Rifle Range Forest. Different species of Pitcher plants are also found in the Sin Seng Quarry area. These Pitcher plants are said to be extinct in Singapore, but look where it has grown. We also spotted an endangered species of Fresh Water Crab, which moved from the Bukit Timah Nature Reserve to be housed in Mandy’s Creek in Rifle Range Forest. These animals move here because the space is pure, available for human engagement just as it is, without additional manicure. If we “renovate” the space haphazardly, we are very sure that the above-mentioned plants and creatures would disappear, and for some, it may even be their last viable habitat. We might well be driving them to extinction with the choices we make. The Rifle Range Forest used to house a Kampung, named Kampung Chantek. It was bustling until 1987, when the government relocated the residents to other areas around Singapore. Some of them, though, still stay close by in the Mayfair Park area. The architecture and lifestyle remains of the Kampung are evident till today. Some days, we would come across photo albums, cutleries and household materials in the forest, with the plants and trees growing all over them. So many stories could be learned of the place. We once met an old lady who used to stay there, and she mentioned how some of the villagers would make rice wine and opium in the old days in the Kampung. The 400 durian trees were planted so that the villagers could get a better payoff from the relocation by the government. The Rifle Range Forest is a place where the history of Kampung Chantek illustrates our peculiar Singaporean identity. With the ever-changing world and globalisation, Singaporeans are losing their sense of identity that is unique to us. A site like the Rifle Range Forest, with its richness of history and nature, would be the place where our stories can be found. If we “renovate” the space ignorantly, and take away such rich culture and heritage, we will lose a place where Singaporeans can truly understand themselves through an organic platform, which is remarkably different from that of watching documentaries or visiting a museum. The forest presents actual living remains, as embraced by nature. The community that lives, exercises and works in the Rifle Range Forest is one that showcases the spirit of kindness in humans, when touched and awakened by the wilderness of nature. There is a true kampong spirit among the residents living behind the Rifle Range Forest (Mayfair Park). Even the people in the shophouses show the same kindness and trust to each other. This community spirit is supported by the lush and wild green areas that lay behind us. The natural forest space is itself a platform for recovering and healing our mind and body. Ever heard of forest bathing? Natural spaces enable holistic and complementary healing from soaking in nature and absorbing stillness and clarity. This could help reduce the amount of medical care for highly stressed city dwellers, as they retreat into the calming presence of the forest. Based on our experience, there are no other green spaces in Singapore that provide such rootedness and kindness among the people that enter them. Parks and gardens are man-made, which leads to a sense of entitlement, unlike the natural forest, which inspires a sense of reverence and respect. If we “renovate” the space arrogantly, we would affect the community spirit of the space. A manicured environment is also not as healing as a natural forest. We love the forest that lies behind us. The connection between the people and the natural forest is real. In this Rifle Range Forest, there are 5 guardians who host themselves on 5 trees in the forest. 3 of them are situated outside, along the trail, and 2 of them are situated in the middle of Sin Seng Quarry. They are the protectors of the space in the woods. They are the ones who allow us to interact with the space safely. They ensure that no elements hurt others. These spirits are there in the forest. If we “renovate” the space disrespectfully, and remove the trees, then replant new trees, how sure are we that these guardians will stay? And how sure are we that in the process of this “renovation” without the guardians, the people working in them will not be hurt? Who is going to pay the price for these losses? In all woodlands around the world, the civilisations and people living near them recognise the mystical presence of these guardians and other elements. That is how we live in harmony with them, with their permission. If we only use science as a measurement of our action, without the respect and spiritual understanding of our connection with nature, we will eventually destroy the only bio-sphere that protects us. And when they are gone, so are we. I will be up front here. I have a vested interest in protecting the Rifle Range Forest. And it is not because I run the Forest School Singapore in the Rifle Range Forest. I can do it at another location anytime. Rifle Range Forest is like home to me. For the past 3 years, it is the place I cry, felt angry, loved, felt disappointed, rested, was reprimanded, led, and got through the challenges in life. The place has become part of my life. It is my life. I will lay my life down, to ensure that for all the protection that she has given us, we will do likewise for her. If we “renovate” the space blindly, and take this part of my life away, I would be devastated. All the years hoping that humans would realise our deep connection with nature instead of our self-created laws would go down the drain. I would give up on people, as many in nature would. To have a more spiritual approach to the re-design of the space. To have maintenance on the areas where human foot load is higher, but leave the wild forest untouched. To not cut down any trees, nor clear paths anymore. We volunteer to be observers and eyes to the going-ons in the forest, and to ensure the safety of people in the woods, through nature. Please preserve the Rifle Range Forest without intruding the space to create man-made park which Spore already have so many. Such a pristine forest with richness in life is worth preserving not only for current generation but more so for future generations and the whole Universe as a whole. We seek govt agency’s consideration to review the plan for ‘another’ park. Thank you. Truly hope that as little disturbance can be given to the place as much as possible. It would be really sad to see hasty disturbance in fragile areas that are prestine with fireflies and other natural life. 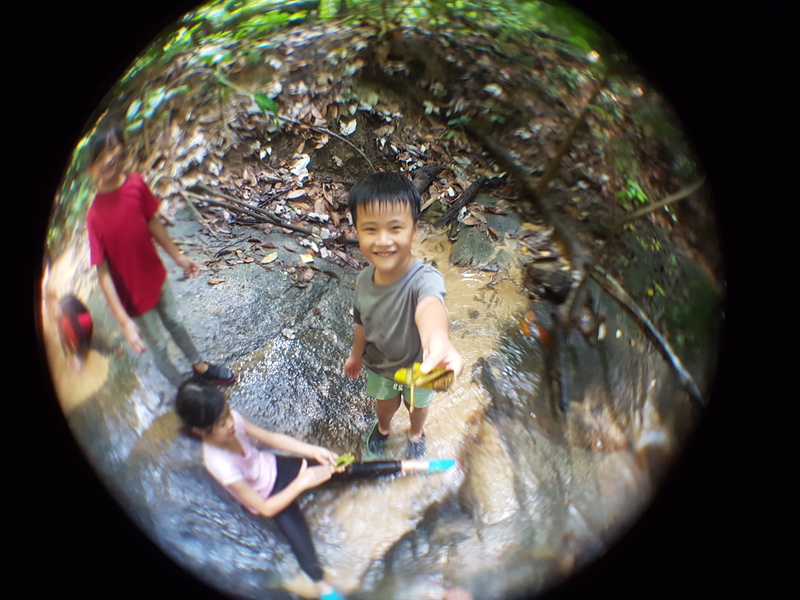 These ecosystems are very magical for those who have taken the time to experience them and their continued existence is important for Singapore’s diversity of experiential life long learning. I hope that development can be as delicately done as possible. Please don’t take away they big boulders that are there. It’s a wonderful place for children and youths to climband play in a “natural” playground. We need to treasure what little-untouched nature that we have and let’s preserve this piece of land.